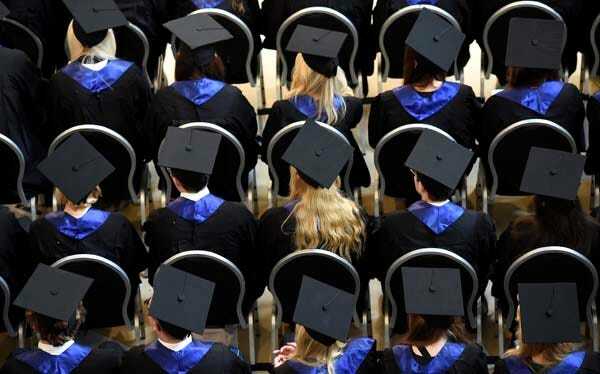 Fabian Bimmer/ReutersStudents attend their graduation ceremony at the Hamburg School of Business Administration (HSBA) in Hamburg, October 1, 2014. College in Germany recently became free for everybody — even international students — after Lower Saxony became the last state in the country to do away with university tuition. Tuition-free university has made education in Germany more accessible, and demand for a German college education has increased both domestically and internationally: foreign enrollment in German universities reached a record high this year. But without the extra funding provided by these fees, German universities have been unable to build more classrooms or train more teachers to accommodate this higher demand, the Economist reported back in 2011. German universities also have a hard time finding places for their students to live, Inside Higher Ed reported last year. There are around 400,000 new students every year and only about 230,000 places to house them, the report noted. This leads to scenarios where multiple students live in a single room. “This is far from luxury, of course,” Niclas Zumholte, a student in Heidelberg sharing a room with several others in emergency accommodation, told Inside Higher Ed. Germany began guaranteeing in the 1970s that every graduate of a Gymnasium — the country’s most academically rigorous type of high school — would be entitled to a place in a university paid for entirely by the state, The New York Times reported. University enrollment increased, but government funding for universities did not. As of 2008, Germans spent only 4.7% of their gross domestic product on higher education, compared with the international average of 5.9%.